Hippocrates– the father of medicine, long time back stated-"Let food be thy medicine and medicine be thy food" which holds true to this date. Nature has provided us with many wonderful medicinal plants which has amazing healing properties. Many common ailments can be cured the natural way with the extraordinary powers of food. Balloon Vine leaves know as Mudakathan Keerai in Tamil (botanical name-Cardiospermum halicababum) is very effective in curing joint pains. It has anti-inflammatory properties and is a rich source of antioxidants. It is widely used in Siddha medicine to cure joint pain. The dosa prepared with mudakathan keerai is super soft and delicious. Now a days, you get this keerai in the market. 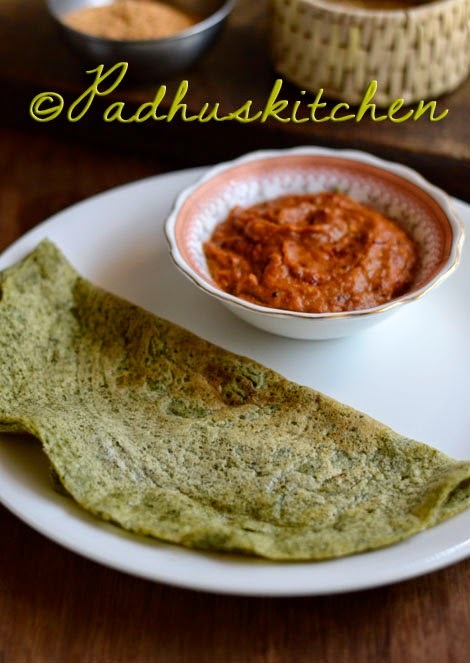 Today we will learn how to make Mudakathan Keerai Dosai following this easy recipe. Wash and soak both the rice, urad dal and fenugreek seeds together for 4 hours. Take the leaves alone from the creeper, wash it well and keep it ready. Grind rice, dal and fenugreek seeds to a smooth paste adding little water from time to time. The consistency should be that of dosa batter consistency. Add the mudakathan leaves also in the end and grind it to a smooth paste. The batter will be in a lovely light green color. Ferment the batter overnight or for 7-8 hours. Once the batter is fermented, you can use it to make dosas. Alternatively if you have idli dosa batter, then grind 1 cup tightly packed mudakathan keerai to a smooth paste, mix it with 6 cups of dosa or idli batter well. Add a tsp of crushed cumin seeds and use that batter to make mudakathan keerai dosa. Adjust salt as needed. Heat a tawa, pour a ladle of batter in the center and spread it in a circular motion. You can make thick dosas like uthapam or thin dosa with this batter. Drizzle a tsp of oil around the dosa, once the edges starts lifting up, flip it over to the other side and drizzle another 1/2 tsp of oil. Once cooked, remove from tawa and serve hot with any chutney of your choice. Check out more Dosa Recipes in the 100 Breakfast Recipes section. 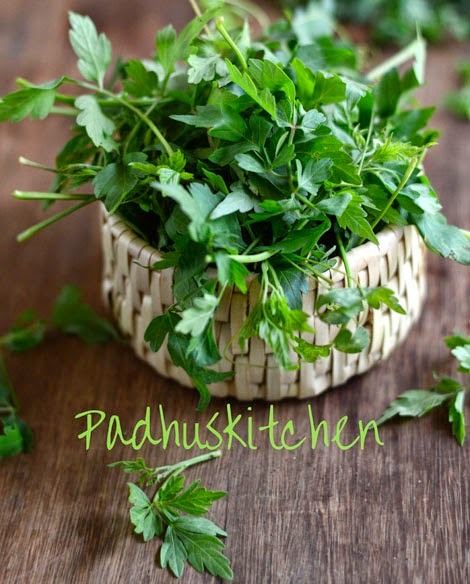 I am a regular visitor of “Padhus Kitchen”, I like your recipes, tried them out and they indeed come out well. I find your dishes can be made with simple regular ingredients, tasty and most importantly healthy. You have become my household name, whenever I want to try something new I say, “Ok let me check with Padhu :)”. Some of the important tips that you give for beginners is very useful, I have learnt a lot from them, also the updates you give on health benefits of a dish is beneficial. Great work, keep going, my many thanks not only for you but also from those whom you have learnt cooking. Hi Padhu, I tried this today. Is fermentation not required for this dosa? I made the batter last night and kept it in fridge as you didn't mention about fermenting. Dosa was a little bit on harder side. Hence asking. Yes, you have to ferment it overnight or for 6-7 hours, if your are grinding the batter from scratch. If you are mixing the keerai paste with the idli dosa batter, you do not have to ferment it again. Hi Padhu....I started cooking only after wedding...ur recipes are really helpful...and makes my day interesting....thank you so much..